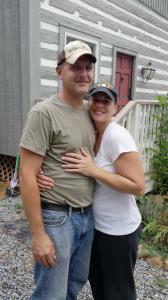 STATESVILLE, NORTH CAROLINA, UNITED STATES, March 26, 2019 /EINPresswire.com/ -- Jason Schumacher and his wife, Leah, both served in the United States Army. Both were deployed to Iraq; Leah also served in Pakistan and Jason in Afghanistan, where he sustained severe back and shoulder injuries in addition to Post Traumatic Stress (PTSD). After retiring from the military, Jason obtained a degree in Mechanical Engineering and Leah earned a Master’s Degree in Social Work. They were married in 2005, and following their deployments, returned home and added two sons to their family. They also bought Leah’s family home, a farmhouse in North Carolina. However, that joyful time was marred -- the very old home they purchased was severely in need of renovation, and the PTSD took its toll on Jason as he felt “different” from everyone else. Purchasing the home exhausted their finances and Jason became angry. At times, he was verbally abusive, emotionally numb, and unable to experience any emotion other than anger, all of which are symptoms of PTSD. The home that Leah and Jason purchased from Leah’s family was 100+ years old. The only heat came from a small wood burning stove, so Jason had to chop wood daily, which caused extreme pain from his back and shoulder injuries. The underpinning around the entire house had disintegrated and wild animals were getting into the house. The kitchen was terrible; it was almost impossible to cook a meal. Purple Heart Homes (PHH, www.phhusa.org) came into the Schumachers’ home and renovated the kitchen, replaced the underpinning, and installed an HVAC system. As a result, the house is warm, rodents remain outside, and the kitchen is now a safe and efficient room where the family can prepare meals and enjoy them together. Working and visiting with the PHH staff and volunteers, many of them Service Connected Disabled Veterans as well, helped Jason begin to feel normal again. He no longer feels “different” and is once again able to experience feelings of joy. The Schumachers’ experience with PHH strengthened their marriage and family life. Today, Jason travels 1-1.5 hours each way, every day, engaging with the staff at PHH and working on PHH projects for other Service Connected Disabled and Aging Veterans. He has completed a Service Dog training program and now has the confidence to frequently go out in public with his dog. Leah, who is a professional social worker, treats veterans suffering from PTSD. Together, the couple has joined PHH’s Hearts of Honor Club, giving back to other Service Connected Disabled and Aging Veterans in need. They have spoken at PHH events, sharing their experiences and their journey from the military, through Jason’s difficulties to where they are now – in a safe and comfortable home, enjoying life and giving back to others in need. accessible home brings to our veterans, who have sacrificed so much for each of us. Please consider donating to Purple Heart Homes, joining its’ Hearts of Honor Club, volunteering for a project, or starting a Chapter in your community. There are so many more of these veterans who need our help. Visit www.phhusa.org to learn more about how you can help Purple Heart Homes in its mission to provide housing solutions for Service Connected Disabled and Aging Veterans. Purple Heart Homes is a 501(c)3 nonprofit organization founded by Dale Beatty and John Gallina, two Iraq combat-wounded veterans on a mission to provide housing solutions for Service Connected Disabled and Aging Veterans that are substantial in function, design and quality. Purple Heart Homes has two programs: Veterans Aging in Place (VAIP), which encompasses the Operation Veterans Home Renovation Project (OVHR), and The Veterans Home Ownership Program (VHOP). From building a ramp for wheelchair-bound veterans to providing home ownership opportunities to veterans with physical and invisible injuries, Purple Heart Homes' programs are designed out of necessity and fit the specific needs of veterans from all eras, helping them age safely in place. For more information, visit www.phhusa.org. Purple Heart Homes - Improving Veterans' Lives One Home at a Time.